I will never forget where I was when I heard that the first plane had hit the Twin Towers - at the DMV waiting to renew my driver's license. I will never forget the overwhelming sadness I felt as I watched the news for the rest of that day. I will never forget that awful feeling in the pit of my stomach as I watched people jumping from the upper levels of the Twin Towers to escape the inferno within there. I will never forget the dismay I felt as I watched first one and then the other tower collapse, carrying so many innocent lives with them. 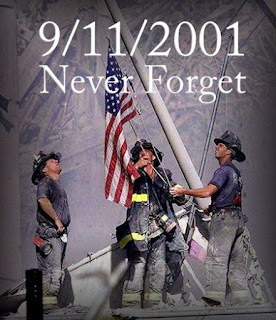 I will never forget the pride I felt at being an American as the country rallied together in the days, weeks, and months following. I hope you will never forget as well.